May 16, 2016 by iCepts Technology Group, Inc.
With manufacturing in Microsoft Dynamics NAV 2016, you can streamline manufacturing processes and adapt quickly to changing demands to give customers what they want, when they want it. Dynamics NAV has much functionality around Made-To-Order and Made-To-Stock Manufacturing in addition to Assembled-To-Order. Bill of Materials is a powerful, functional & easy-to-maintain manufacturing feature in Microsoft Dynamics NAV 2016. BOM is an innovative routing design of Dynamics NAV that allows the users to have different versions of the both BOM and routing, with the added ability of running comparison reports for various BOM versions of the same item. It also provides separate functionalities for collecting adequate labor for specific purchase orders, tracking discrete labor & burden costs of production operations, and a requisition mechanism for relating NAV to the purchase orders. With Agile Manufacturing in NAV you can plan rush orders, make exceptions, and handle last-minute changes to your manufacturing processes with multiple planning options, tracking, and interactive action messages. Add capacities (work centers) to the manufacturing process. Set up routings and use these routings on production orders and in material requirements planning. View loads and the task list for the capacities. Finite Loading of capacity-constraint resources management is also part of manufacturing functionality in NAV. This ERP manufacturing feature is used for taking capacity constraints into account so that no more work is assigned to a work center than the capacities can be expected to execute during a given time period. This is a simple tool without any optimization. Used with the Order Promising module, Finite Loading also enables the system to calculate capable-to-promise (CTP). Furthermore your manufacturing operations can add Machine Centers as capacities to the manufacturing process. Machine centers are designed to help you manage capacity of a single machine/producing resource. With machine centers, you can plan/manage capacity on several levels: on a more detailed level for machine centers and on a consolidated level for work centers. Machine centers allow users to store more default information about manufacturing processes, such as setup time or default scrap percentage. The Setup for items with their own reordering policy; including registration of whether they are manufactured by or purchased from a third party. Demand Forecasting is also included to forecast based on items. Input demand (sales) forecasts for products and components in a more convenient way (daily, monthly, quarterly). This data allows the system to plan and create production and purchase orders taking into consideration the demand forecast together with the level of available inventory and parameters of requirement planning. All of this information is easily presented in NAV”s RoleTailored User Interface called “Role Centers”. Role Centers in Microsoft Dynamics NAV (NAV’s customizable user client interface) give you quick access to the data, reports, and tasks that are relevant to your job. Enhance operational efficiency and effectively manage production with quick access to production orders, bills of material (BOMs), supply planning, and capacity requirements planning. Take advantage of a simplified manufacturing foundation that includes rapid visibility into work in progress (WIP) data and support for order-by-order work flows. You can personalize your Role Center based on business needs and monitor critical business processes in a dashboard view. 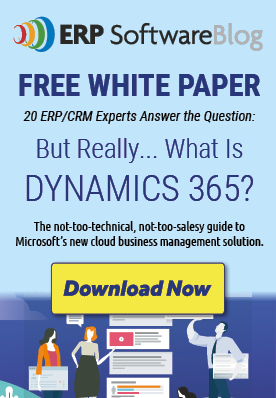 Learn more about Manufacturing in Microsoft Dynamics NAV 2016.